I received an email from the Makerslide store yesterday. They’re taking some pre-orders for the Hadron Ord Bot! I placed my order within 10 minutes of getting the email. I completely love the design of this printer. 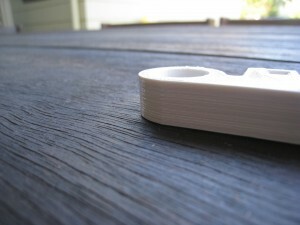 The Makerslide makes the printer very clean and simple, but not fragile, like the some of the recent printers. 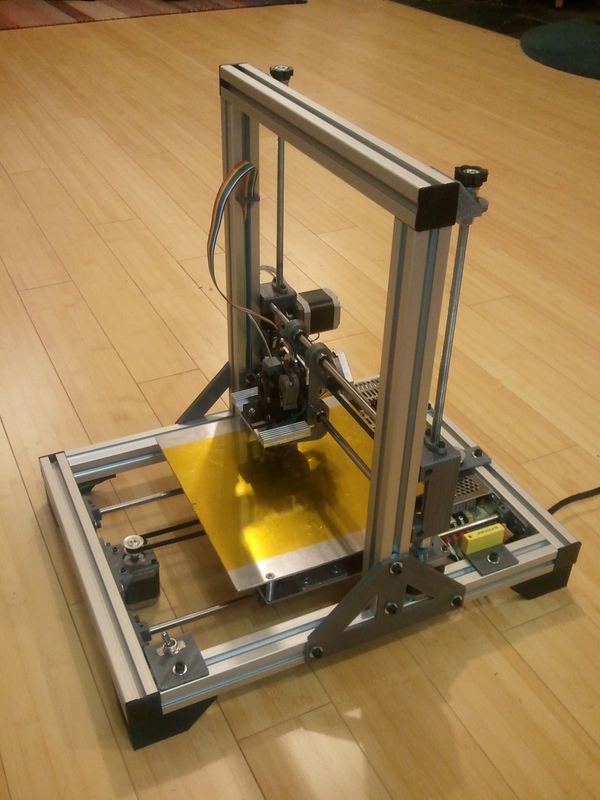 US$419 for the frame and motors. Fairly good value when compared to a Mendel. I just needs an extruder, hot-end and electronics. 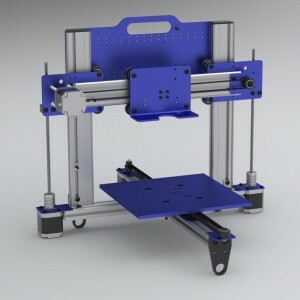 Since there will be ‘some assembly required’, I wouldn’t recommend it to beginners, but if you’re on your second printer, or have someone experienced to help you, then grab one now! This entry was posted in reprap and tagged hadron, inventables, ord on May 4, 2012 by David. Hi, your prints are really nice. 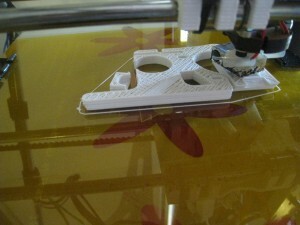 I am trying to get that with a Prusa Mendel but it is impossible. Could you help me with Skeinforge settings? I don’t use much in the way of settings these days. I use SFact on pretty much its default settings. The only changes I make are to the layer height (0.33mm), and the number of extra shells (0 to 1, depending on the print). Even the retraction is now kept on the default settings. I keep speed very low for the first layer, 15mm/s for the perimeter, 20mm/s for infill. This ensures excellent adhesion with the heated bed, at 220 degrees. After the first layer, I turn the temp down to 197 degrees, and set the speed to 30mm/s for perimeter, and 60mm/s for infill. When I was complaining about the print quality of the Prusa in a recent post, I didn’t really mean it. Look at these photos. Fantastic. X, Y and Z axes are all spot-on with their precision. But I’d like to do better still, particularly in getting rid of ‘dribble’ from the hot end. This entry was posted in reprap and tagged printing, settings on April 7, 2012 by David. 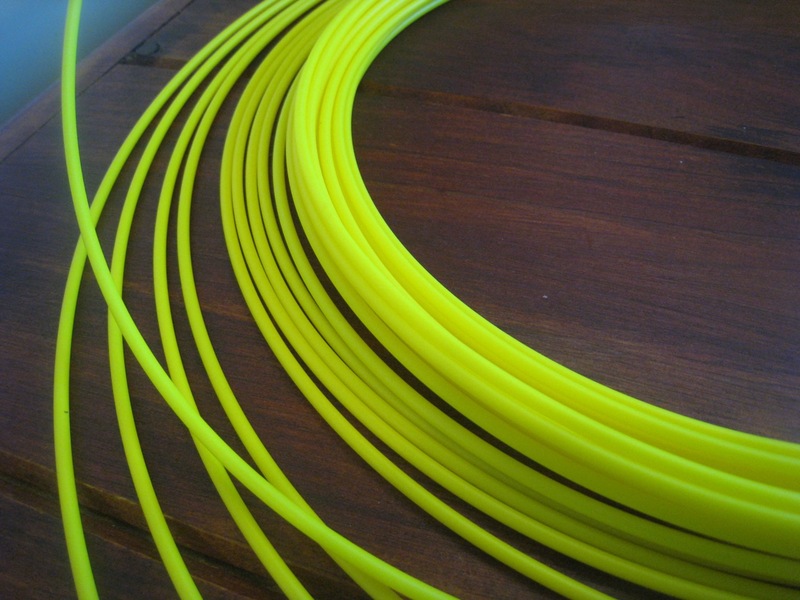 During the week, Jeremy from Lybina posted on the Australian Reprap forums that they’re now making some coloured filament. 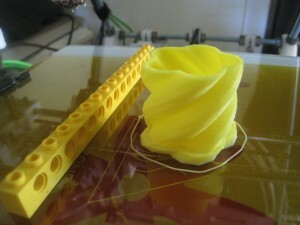 This is great news for Australia reprapers. We’ve been well-supported with very-high quality white filament from Lybina, but they haven’t had any colours available. Even better, they were giving away some free samples. I came to the post over a day after it’d been posted, so I thought that I’d miss out for sure. I gave Lybina a call anyway, and they said that I was the first! 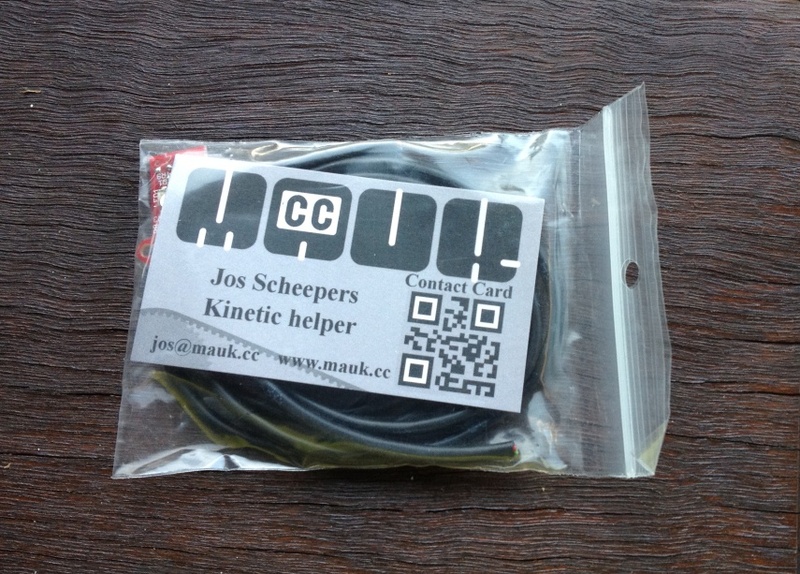 This was pretty surprising, given that it’s free high-quality filament. 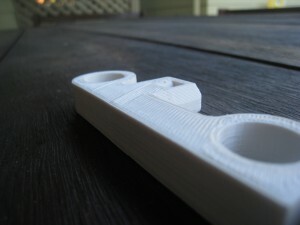 I think that most people in Australia print with PLA, but it was still surprising. 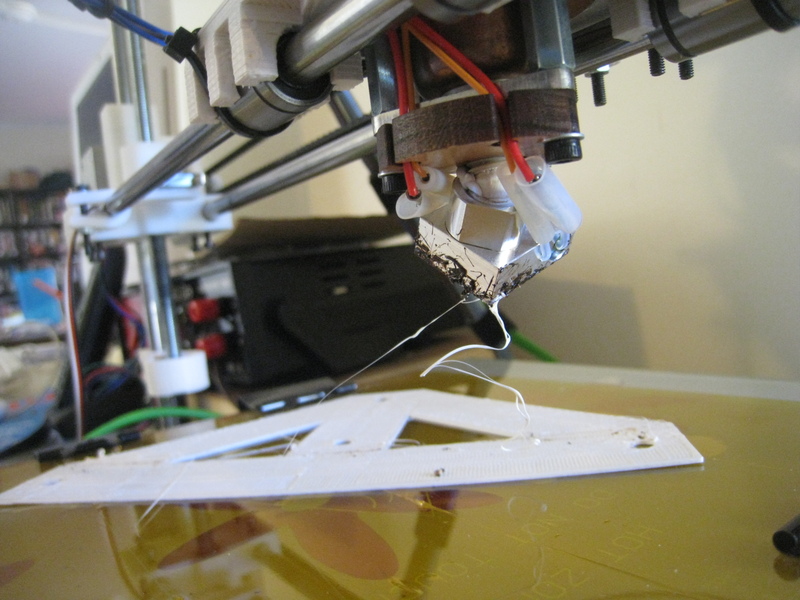 The only catch is that you have to pay for the postage, and report back to Lybina how the filament printed. They were giving away samples of yellow, green and purple filament. 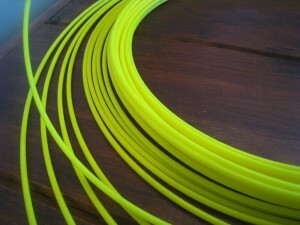 I put my hand up for some yellow filament. All my printing so far has been with Lybina’s white filament, so I was pretty confident that they’re product would be good. The filament arrived by courier yesterday afternoon. Pulling it out of the bag, it looked great. Solid yellow colour. A quick check with the micrometer showed that Lybina’s manufacturing was as good as always. First sample was 3.00mm on the long axis, 2.90mm on the short. A check on the other side of the roll had 2.95mm and 2.90mm. 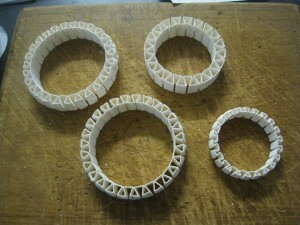 For my first print, I thought that I would print out one of the ‘screwable jewellery boxes’ which I have done before. Being quite delicate, and requiring precision, I thought that they would be a good test to see how the filament performed. When I was talking to Jeremy on the phone, he mentioned that the colours are only stable up to 220 degrees C. Since I usually do my first layer at 230 degrees C, this might have caused a problem. So I turned down the hot-end to 219 for the first layer. I made sure that the heated-bed was up to all the way up to 110 degrees (rather than my usual ‘anywhere between 100 and 110 is fine’) before I started printing. Adhesion was great, with no issues at all. For the remainder of the layers, I dropped back down to my usual 197 degrees. 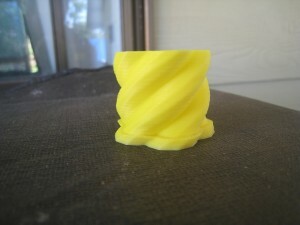 As you can see from the photos, the filament printed just fine. However, the colour was quite pallid. I was expecting much more of a ‘lego technic beam’ colour, rather than ‘pale lemon’, which was a bit disappointing. It looks like they need to use more dye. Overall, I’d give the plastic a 10/10, but the colour a 6/10. A big thanks to Lybina for providing the free sample! 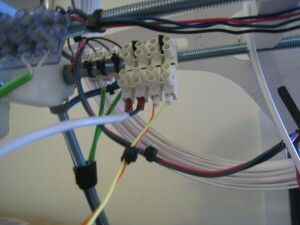 This entry was posted in reprap and tagged colour, filament on March 31, 2012 by David. For a while, I’ve been thinking about building a new printer. I’m pretty happy with how the Prusa has worked out, but I’m becoming keenly aware of its limitations. 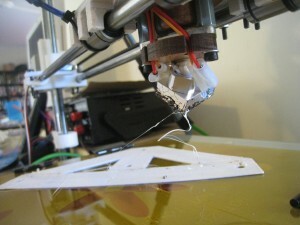 One of the main limitations that I see with the Prusa is that it looks like it’s made by amateurs. It doesn’t have that ‘Polished’ look that makes it look like it’s being designed by an industrial designer. That makes it hard to keep inside the house. The other limitation is the print quality. Whilst you can get excellent prints with the Prusa, I think I’m definitely at the point of diminishing returns, where I’ll have to put in exponential levels of effort to get small improvements. 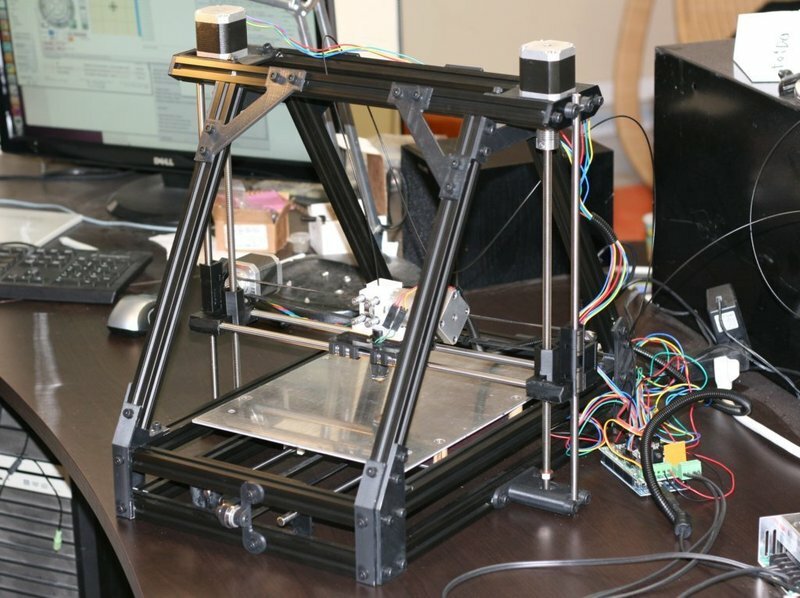 A superior printer design should get to a higher level of printing quality with less effort. I haven’t quite decided what printer I’m going to build yet. For a while, I was settled on building a MendelMax printer. The problem that I see with the MendelMax is that it’s inefficient with its use of the aluminium extrusions. 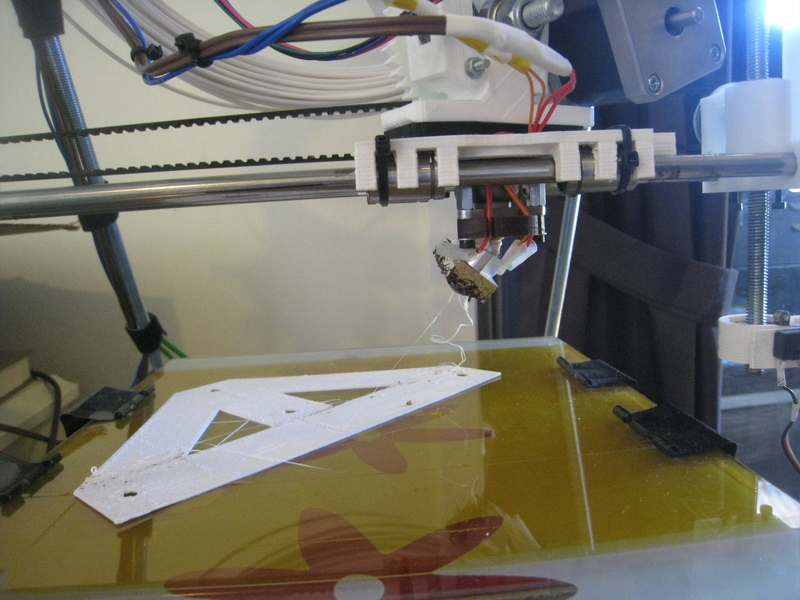 While replicating the Prusa frame has its advantages, I think that its structural elements are overkill, and still don’t solve the Mendel’s issue of having little support along the X-axis. But then I saw two new printers, namely the Quantum Ord, and the ‘Aluminum Mendel’. The Ord bot looks fantastic, looks also good enough to be a commercially-made device. It’s very minimalist, and uses the Makerslide as a structural element, not just as a sliding surface. I love the design of the Quantum Ord, but MakerSlide at the moment is highly unobtainable. I’ve been signed up for the Makerslide shop for a few weeks, but every time he releases a batch (at about 12-1am in the morning here), it’s sold out by the time I wake up and check my emails. To make matters worse, I didn’t even receive the email when Barton announced he was selling some Ord bot kits, so I missed out on them as well. I’m also considering a merge-build. Use Makerslide for the axes movement on a MendelMax. However, this seems to be extremely wasteful usage of the Makerslide, since it’s strong enough to be used as a structural element by itself. Since the Makerslide is so hard to obtain, I’m thinking of going for the ‘Aluminum Mendel’. I really like this design. It’s much simpler than any other design, with the exception of a Printrbot, but uses Aluminium extrusions for strength and rigidity. One feature that I particularly like is that all the components of the printer are inside the frame. Nothing hangs out, not even electronics or the power supply. Extremely clean. One thing that annoys me however is the ‘Mendel’ tag. It’s not a Mendel in any way, in my opinion. Mendel printers should have the ‘raised A-frame’ design. It does have a suspended X-axis, like the Mendel, but that’s about the only similarity. I’m still deciding at the moment. I’ll post again when I’ve made my choice. 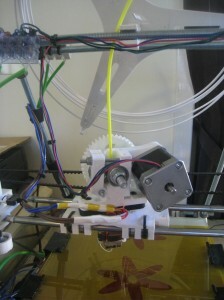 This entry was posted in projects, reprap and tagged Al Mendel, MendelMax, ord on March 20, 2012 by David. 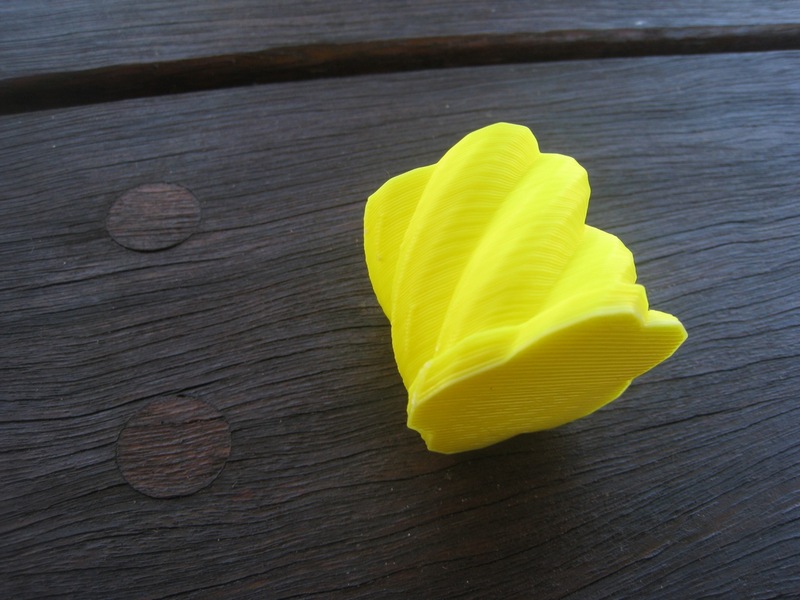 In Julian’s blog, he talked about one of his recent designs – a piece that was designed to answer a challenge on the Thingiverse blog. He noted that he hadn’t printed it out yet, so I thought that I’d have a go this afternoon, see just how well it turned out. I downloaded the piece from Thingiverse, and printed it out. Trying to take a decent video showing the illusion was by far the hardest part of this mini-project. This was my best attempt, which I think did the trick. Unfortunately, these balls were a bit big for the job. This entry was posted in reprap on March 11, 2012 by David. I haven’t been doing much printing lately, the usual hassles of life catching up with me. I’ve printed up a few more of the earbud holders over the last few weeks, for people who are jealous of the ones that I gave out during Christmas. 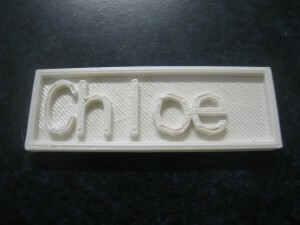 A couple of weeks ago, I spotted this page over on thingiverse, which generates some nameplates. I thought that these looked like a lot of fun, and an easy way to print name-tags for the kids’ bags and stuff. I printed out a few of them one evening while my wife was having a craft night with her friends. They loved them, so I ended up printing out lots of them for their kids as well. Last week, I went through and updated the software toolchain – SFact, Pronterface and Marlin. It never fails to amaze me just how much improvement comes through in the software, over the space of two months. 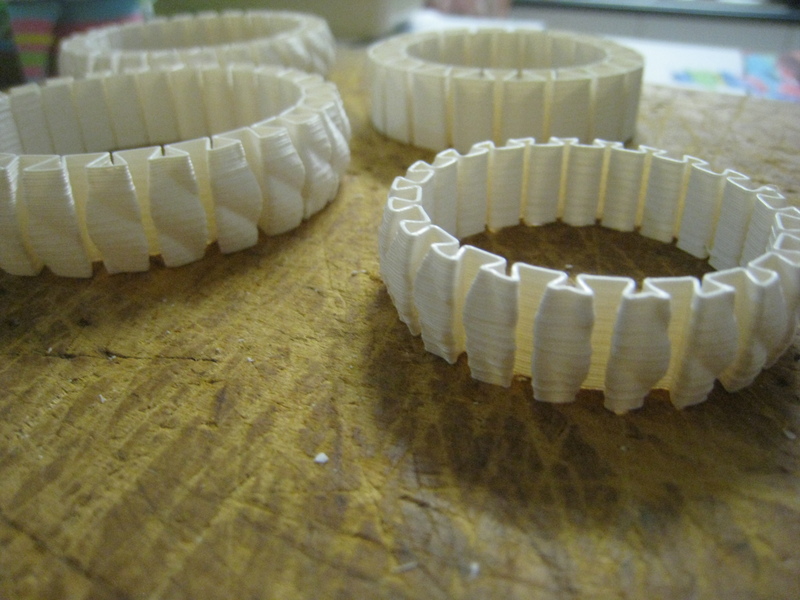 The only other thing of note that I’ve printed out lately is some bracelets. Slightly strange story behind these – when I was speaking on the phone with my Mum a few weeks ago, she said that she had a dream that I’d printed her out a bracelet. 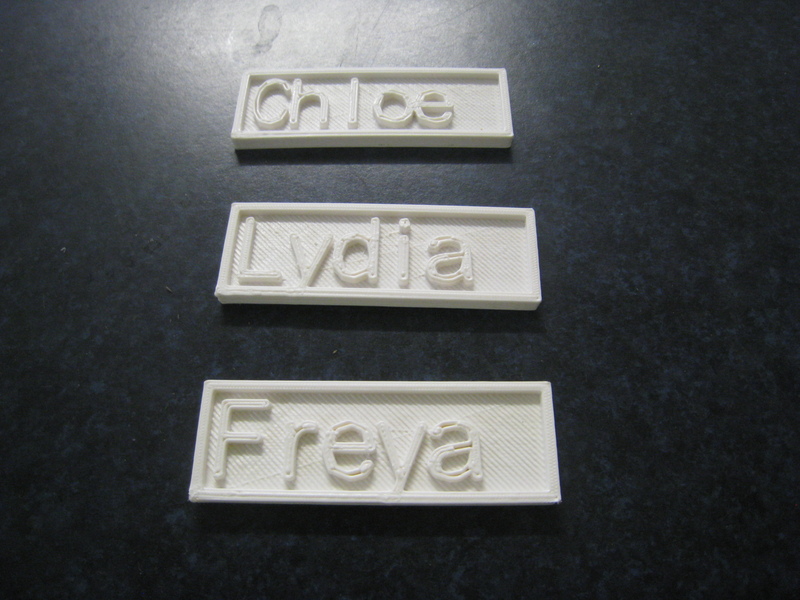 So, to make the prophecy self-fulfilling, I found a design on Thingiverse and printed a few out for my Mum and daughters. Turned out very nicely. I adjusted the size of the first couple of larger ones by playing with the ‘scale’ setting in SFact, but this didn’t work very well with the smaller bracelets. So I downloaded the OpenScad file, and modified the variables in that. That worked really well to generate the smaller bracelets. The printer’s working really well these days, completely hands-off. I just hit ‘print’, then walk away. 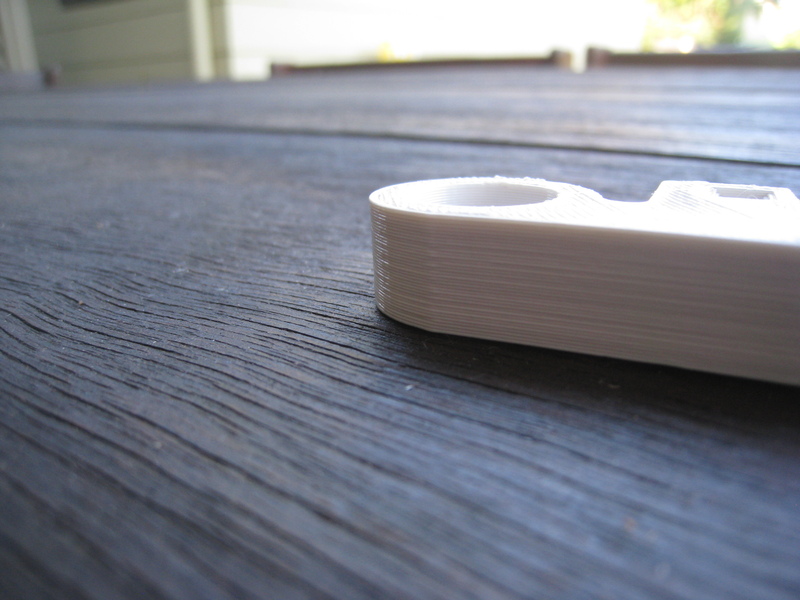 The printer even shuts itself down at the end of the print, and always produces nice results. This entry was posted in reprap and tagged host software, print on February 22, 2012 by David. 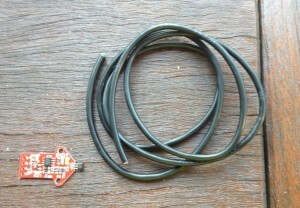 This is a copy of the post I made to the Australian Reprap forums. Back when Reprap was young, it was a principle of the project that all printers would print out and give away one set of parts, to help the project grow. This idea has largely fallen into disuse over the last couple of years, but the idea is a good one. However, printing out a full set of parts is a fairly daunting task, and requires a fair amount of printing time and material. In addition, there are numerous organisations and individuals out there who could benefit from receiving the ‘seed parts’ for a 3D printer. This proposal is an idea that I’ve had for a while. Now I’ve got my printer up and running to a decent level of quality that I can make parts that I would be willing for someone else to use, I thought I’d put it to the group. As the name suggests, this project will seek to enlist members to print out one part per month. These parts will be sent to recipients who can benefit and use these parts to build their own 3D printer. As can be seen, this will require eighteen people in the project. At the start of each month, a recipient will be selected from a group-agreed list. The members of that project will then print out their pieces and mail them off individually to the recipient. This keeps the administration of the project to a minimum, but does require the project members to keep their word and mail off their parts. Just about all of these parts can be printed in an hour or less, and only use a few grams of plastic, so it only represents a modest investment. Most likely, the postage for each part will cost you more than the plastic. Many of us aren’t part designers, or wiki writers. 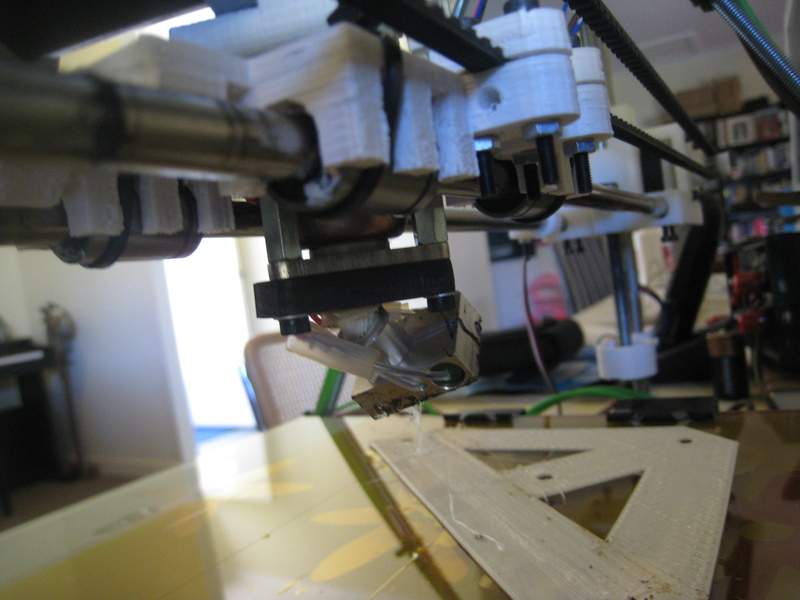 We don’t contribute much back to the Reprap community other than through helping people in these forums. This project will be a way for us to give back to the Reprap community, using the very tool that community helped us to create. If you’re interested in joining this project, please respond to this thread, stating which part you’d like to print. Personally, I’d like to print part ‘7’. In addition, I’m also seeking to create a list of recipients. If you know of worthwhile recipients, post them up and we can discuss and add them to the list. Suggested recipients: Hackerspaces, schools, uni labs, maybe even as prizes for STEM competitions. Since this is an Australian forum, I’d suggest keeping it to Australian recipients for now. Here’s some questions I’ve anticipated. I’ll add more to the list as they get asked. Q: I only print in PLA / ABS! How will mixed parts work? A: I can’t see any problem with having mixed printers. My only suggestion is that people who only print in PLA sign up for the ‘PLA recommended’ parts first, ie bushings, and ABS-only printers sign up for the ‘hot’-pieces first (X-Carriage, Extruder). Q: I don’t want to print out any parts, but I’d like to help in other ways! A: If you’d like to help, let me know. There are plenty of other ways you could assist. For example you may wish to donate a couple of metres of ‘starter’ filament, or machine up a hobbed bolt, or a couple of bits for the hot-end. Make a suggestion! Q: Which set of pieces should we print? There are so many variations, ie, printer feet, linear bearings, etc. A: To start with, we’ll only print up the ‘Prusa standard’ parts list. I’d suggest that we fully embrace the ‘iteration 2’ Prusa. To ease confusion, we’ll probably create a github repository, with only the PPMP parts in it. But I don’t want to be too rigid. If someone’s willing to donate the linear bearings, then we may go for LB pieces. 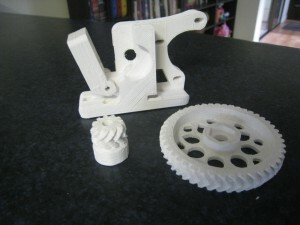 Likewise, if someone is willing to print up the extruder and the gears, then that person can choose which one they print. Depending on the number of people, and their willingness, we may also choose some pieces such as the ‘combined frame axis and Z-Motor Mount’ parts. Q: What if we don’t get eighteen people involved? A: If we only get nine people, then I’d suggest that we keep the ‘one part per month’, just have different parts on alternate months, and thus the project will donate one full set every two months. Q: Sounds great! When do we start? A: I think it’d be best if we target the start of April as the starting date. This will give everyone enough time to sign up to the project, practice ‘their’ pieces, and be ready to go in the start of April. 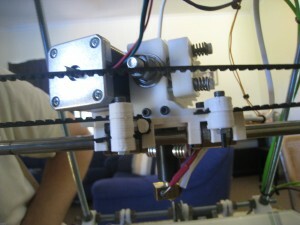 This entry was posted in PPMP, reprap and tagged PPMP on February 3, 2012 by David. A few days ago ‘Schulz’ made a post on the Australian forums. 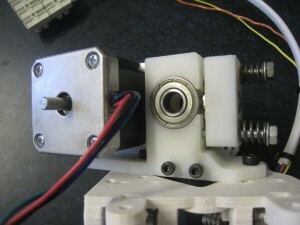 He was looking to buy a modified Wade’s Extruder that would fit on the Arcol hot-end. Those who’ve read through this blog think that this story sounds quite familiar. 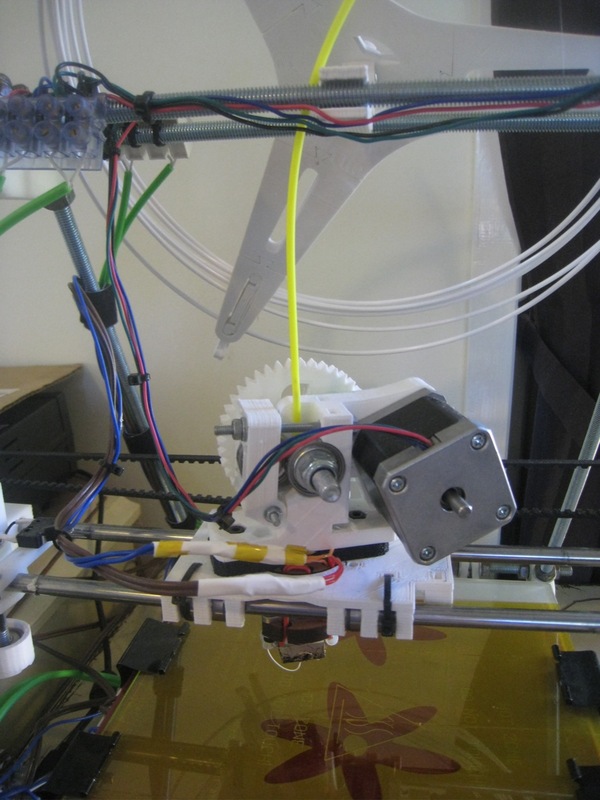 So, taking pity on a fellow sufferer, I offered to print him up a Greg’s accessible extruder for him for free. First thing up was to find the STL files. Looking at the parts posted on Thingiverse, it looked like the STL files posted there weren’t pre-compiled for the Arcol hotend mount. 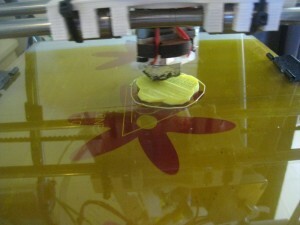 I get around that limitation, I downloaded the OpenScad file also published along with it. Opening up the file it looked good, but wouldn’t compile without a bunch of warnings. It was missing some configuration files that were meant to go along with it. At first I tried having a look at Thingiverse, to see if the missing configuration files could be found there. Unfortunately not. I then had a revelation. I went to Github, and did a search for Greg Frost. There he had his fork of the Prusa files there. Looking in the list, I saw a newer version of the extruder file, and all the configuration files that it was looking for. Once I had all the right configuration files, the extruder compiled just fine. 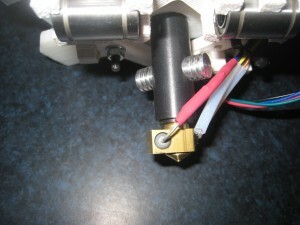 I then added in the options for the groovemount, and the Arcol hot-end. For some reason, the groovemount option didn’t compile in correctly, but the Arcol mount did, which is all that I was looking for. I then exported the file to an STL, and loaded it up in Pronterface. The estimation came up as three hours, fifty minutes. Three hours later, the print finished. What struck me during the print was all the solid layers. I only used my standard 35% fill, but it printed with a lot more solid layers. It must be a feature of Greg’s design to include lots of solid reinforcing layers. In all, I was pretty happy with the print. It doesn’t look quite as good as Greg’s extruder that’s on my machine, but it’s relatively close. Interestingly, mine required less cleanup than Greg’s did, but his surface finish is superior. Printing out the object gave me a great sense of admiration for Greg’s design. It’s by far the most complex print I’ve ever done. Whilst the snowflake’s were complex, they were only complex in a two-dimensional manner, and were just a extrusion of that two-dimensional shape. 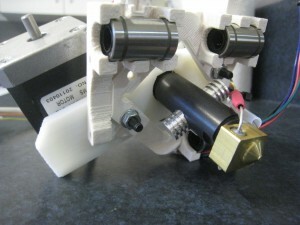 The extruder is a true 3-D shape of high complexity. 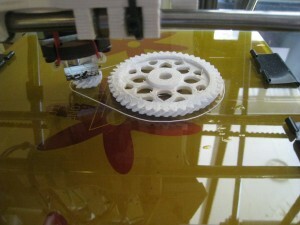 After I did the extruder, I went to do the gears. I didn’t want to print out the standard gears, so I found some STL files for some herringbone gears. The herringbone gears mesh together more tightly, so there’s less backlash from the extruder. Also, even though they are a more complex shape, I think that they’re more forgiving for poor printing. The gears printed out fairly well. My main concern for the print was that the top of the small gear would get too mushy from too small a print area. To get around that, I put in some ‘orbit’ around the print. Unfortunately, I forgot how oozy my hot-end is. It meant that there was a lot of fine strings all around the print that needed to be cleaned up at the end. The teeth on the large gear printed fairly well. The teeth on the small gears not so well. They were a bit blobby, and needed some cleanup. They tidied up pretty well, and I think that they’ll work fine. They seemed to mesh together nicely. All up, it was a very good test for my printer, one that I think it passed fairly well. Yesterday, I threw all the pieces in the mail. Hopefully, they’ll work great for Shulz and get him on the path to printing! 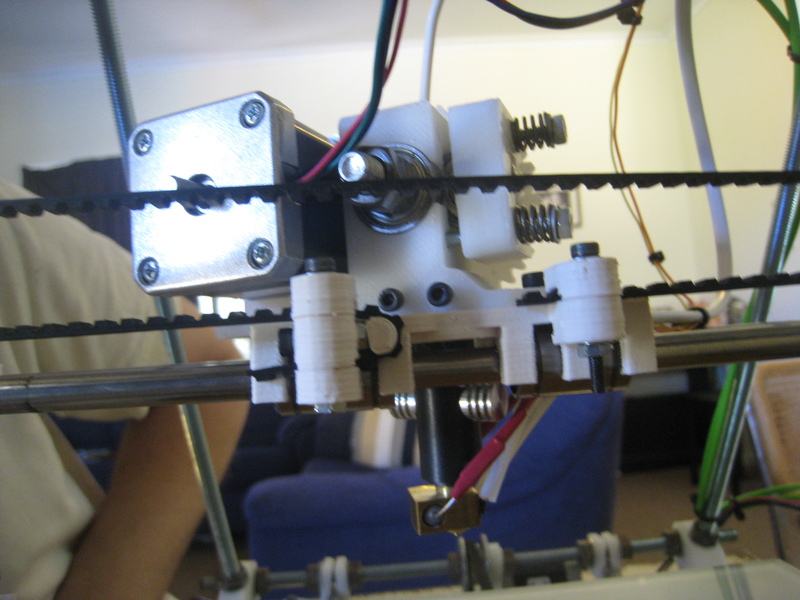 This entry was posted in reprap and tagged arcol, extruder on January 17, 2012 by David. I made a little purchase in the middle of December, and there was a nice package waiting for me when I got home from holidays – Hall Effect endstops! For those who aren’t familiar with the Hall Effect, it’s the voltage difference generated by a magnetic field. They can be used as a non-contact distance-measuring device. 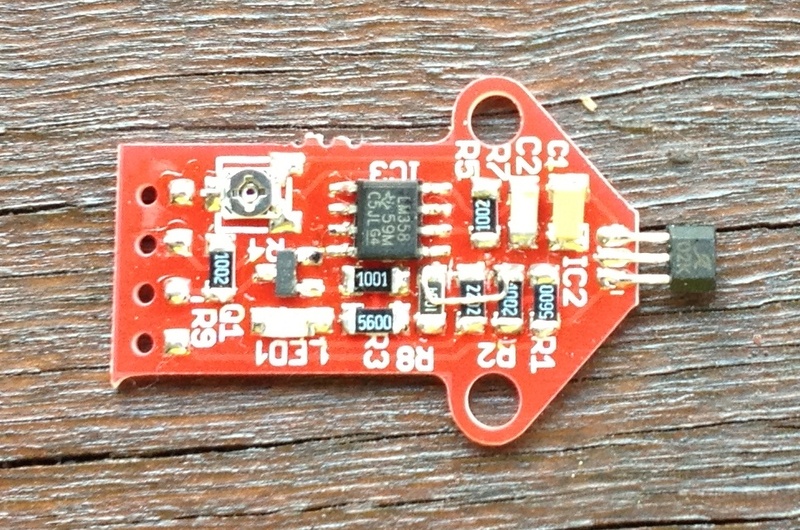 Hall effect sensors are used in various devices, most notably DC motors with fixed magnets, as a timing measure. The wiki page can be found here. Its advantage is that it’s a non-contact, adjustable endstop. The problem that I have with the current endstops is that adjusting them is a pain. You have to have them attached fairly tightly to prevent them from moving during normal operation, but then trying to loosen them and adjust them by a small fraction of a mm is fiddly. This isn’t a problem for the X or Y-axes, which don’t require so much precision, but I find adjusting the Z-axis ‘just so’ to be very time-consuming and inaccurate. Lots of back-and-forth until the distance is ‘right enough’. So, I purchased these Hall-effect endstops from mauk.cc. He makes these, and sells them fully assembled for 9 Euros each. At that price, I couldn’t resist giving them a go. I’m going to use this endstop to replace the Z-axis microswitch. Due to limitations in the firmware, you can’t just set the printer to stop at a particular distance from the endstop. (Though that would be extremely nice.) It operates as a standard endstop, with an ‘on’ or ‘off’ signal. However, you can adjust (via a trimpot), the distance at which the ‘on’ signal activates. 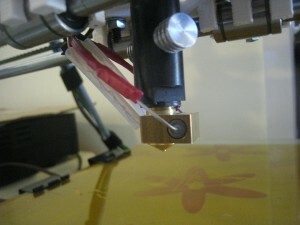 Thus, you can easily and quickly adjust the distance of the printbed to the nozzle. I’ll set this up over the weekend, see how well it works. 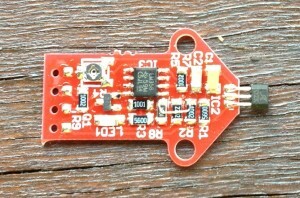 This entry was posted in reprap and tagged Hall-effect on January 5, 2012 by David.